I have a confession: I am a shopaholic. My shopping issues do not manifest themselves in the form of designer handbags or shoes. Oh no, when I come home from a shopping spree I have bags stuffed with all manner of comestibles, only the bare minimum of which actually appeared on my rambling shopping lists (I always have more than one). You see, aside from actual cooking, I can think of nothing that is more therapeutic than wandering the aisles of a grocery store. I get so excited by new things, especially produce and cheese that I have never tried before, that somehow they end up in my cart, even though I don't have any recipes in mind, and I have a fridge and cabinets full of food at home. And there's the rub; when it comes time to put my new groceries away, I inevitably find some sad, forgotten produce in the bottom of my crisper and I am overcome with guilt when I have to throw it away. This is the point where my grocery shopping-addicted self promises to stop the insanity; only essentials until the fridge is no longer overflowing! Of course, it never lasts. I was at the supermarket for a gallon of milk and some bananas when I spotted the baby artichokes. They were just so cute (there is something irresistible about mini-vegetables, stayed tuned for my baby eggplant adventure), I had to have them. So I came home with baby artichokes and no idea what to do with them. I had prepared a fresh artichoke once, years ago. I cooked it in the microwave and I made some terrible aioli that immediately went in the trash. Certainly not the best way to be introduced to fresh artichokes, and from that point on my artichokes came from a can; fresh artichokes were too daunting. Well, my baby artichokes almost went the way of so much previously dumpster-ed produce. After I brought them home I got caught up in making some other dishes and I forgot about my little 'chokes. When I saw them in my veg drawer while digging for carrots to make stewed lentils, they were already slightly past their prime, and I knew that I had to [wo]man up and conquer my artichoke fears. Had I known just how easy and delicious these provencal style artichokes were, they never would have lasted more than a few hours in my fridge. This recipe is from Mark Bittman, and I actually found a link to it in the comments of a Smitten Kitchen post. I watched the video of him making the dish and I thought, "I can do that." I am happy to report that I only had to sacrifice one baby artichoke to the disposal gods, the rest were beautiful once I pulled off the not-so fresh outer leaves and chopped their little heads off. As I prepped my 'chokes I repeatedly asked myself why I had been so intimidated by this vegetable. Baby artichokes are less work because you don't have to take off as many of the outer leaves and there is no choke to remove, but really, is taking out a choke so hard? I will definitely be trying the big guys soon, too. But about this dish, wow. It was so simple, only a handful ingredients, but everything worked together perfectly. The fresh artichokes were a revelation; miles apart from their canned counterparts. The garlic (I threw in extra because I am a garlic-aholic in addition to a grocery shopaholic) became soft and sweet, and the kalamatas provided the perfect salty bite. Because I am not as much of a minimalist as Mark Bittman, I added some white wine to the mix and finished off the sauce with a touch of butter. 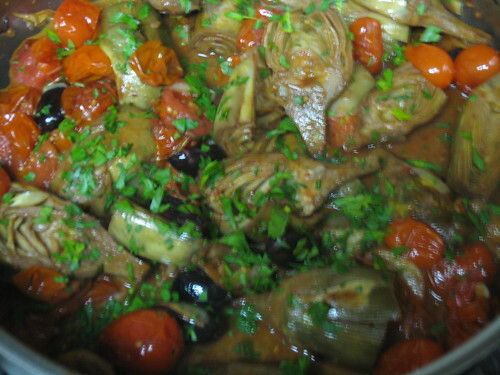 Oh, and that sauce; the white wine combined with the garlic-scented olive oil and the juice from the collapsed, caramelized tomatoes and cooked down to wrap lovingly around the tender baby artichokes. I want more right now. 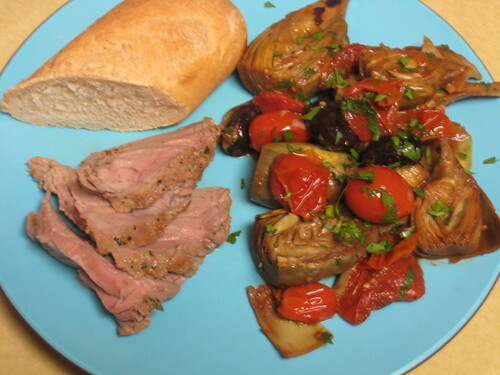 I would have been perfectly content to eat a plateful of these artichokes and chunk of bread (preferably homemade, though the sauce elevated even our lackluster supermarket baguette), but I also made a pork tenderloin. I used Ina Garten's herb-marinated tenderloin recipe and swapped lemon thyme for the rosemary. I also forgot to add olive oil to the marinade, but it didn't seem to affect the finished product (Food Network chefs seem, to me, to be a little too liberal with the olive oil anyway). Andrew loved the tenderloin, but for me it faded into the background. Luckily Andrew only wanted seconds of the pork, because I would have fought him for the last few artichokes. Combine oil and garlic in a large skillet over low heat. 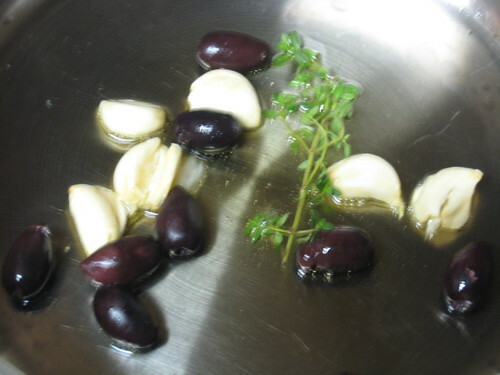 When garlic sizzles, add thyme, olives, and a pinch of salt. Meanwhile, one at a time, prepare artichokes: remove hard outer leaves, then cut off spiky ends, about an inch down from the top; peel stems and trim. 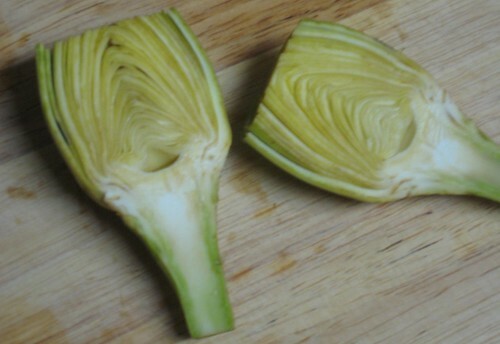 Cut artichokes in half and add to the pan as they are ready, cut side down. When about half are in the pan, raise heat so that they brown a bit; move them around as you add the remaining artichokes so that they brown evenly. 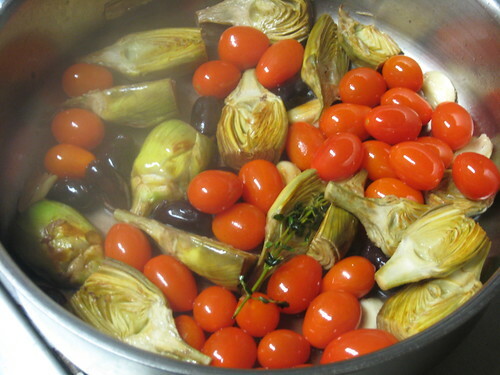 When artichokes are golden, add wine and tomatoes, and continue cooking until artichokes are tender, about 20 minutes, adding water as needed if the pan becomes too dry. Stir butter into sauce, adjust seasoning, and sprinkle with parsley. Serve hot or at room temperature.